An Iranian human-rights activist and Nobel laureate has joined the legal team of an Iranian-American journalist convicted of spying and jailed in Iran. 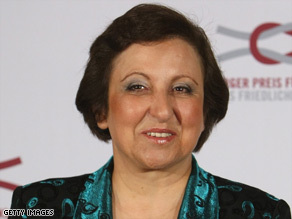 Shirin Ebadi, who won a Nobel Peace Prize in 2003, took up the case of Roxana Saberi at the request of Saberi's family, her father, Reza Saberi, told CNN Wednesday. Ebadi heads the Center for Defenders of Human Rights in Iran. Saberi, 31, was sentenced Saturday to eight years in prison after a one-day trial that was closed to the public. President Obama, as well as other U.S. and international officials sharply denounced the decision. The Rev. Jesse Jackson has offered to travel to Iran to help seek Saberi's release. "If our voices are heard in Iran today, I would be anxious to travel with a delegation to Iran, if we are permitted, and make an appeal for her freedom," said the longtime civil rights activist, according to his Rainbow PUSH Coalition. Jackson, 67, spoke Tuesday at a peace conference in Kuala Lumpur, Malaysia. "Whenever we've brought people out of captivity, whether in Syria, Cuba, Iraq or Yugoslavia, or Liberia, it's always opened a diplomatic door to reduce tensions," he said. Saberi's attorneys said they will appeal her conviction. Judiciary Chief Ayatollah Hashemi Shahroudi ordered the head of Tehran's Justice Department to make sure the appeals process is quick and fair. Jackson has offered in the past to help release American hostages, most recently in 2005. At that time, he said he was willing to use his role as a religious leader to help secure the release of Roy Hallums, who was kidnapped along with five others in Baghdad in November 2004. Hallums was freed in September 2005 when U.S. troops raided the farmhouse where he being held outside Baghdad. In 1984, Jackson secured the release of a Navy pilot held in Syria. In 1991, he helped secure the release of 500 "international guests" held in Iraq. And in 1999, he persuaded Yugoslavia to release three U.S. soldiers held there during the Kosovo conflict. "We are working to make sure that she is properly treated, and to get more information about the disposition of her case," Obama said Sunday. "She is an American citizen, and I have complete confidence that she was not engaging in any sort of espionage." Iranian officials initially said Saberi was held for buying a bottle of wine. The Foreign Ministry later said she was detained for reporting without proper credentials. Saberi, who comes from North Dakota, has been living in Iran since 2003, said the Committee to Protect Journalists, a journalists' advocacy group. She has freelanced for National Public Radio and other news organizations, and was writing a book about Iranian culture. Iranian authorities revoked her press credentials in 2006, but Saberi continued to file short news items without permission, the journalists' group said. Saberi was detained in January, although no formal charges were disclosed. On April 9, word emerged that Saberi had been charged with espionage. "Without press credentials and under the name of being a reporter, she was carrying out espionage activities," Hassan Haddad, a deputy public prosecutor, told the Iranian Students News Agency. Authorities also said Saberi had confessed. Her father said he thinks she was coerced into making damaging statements.